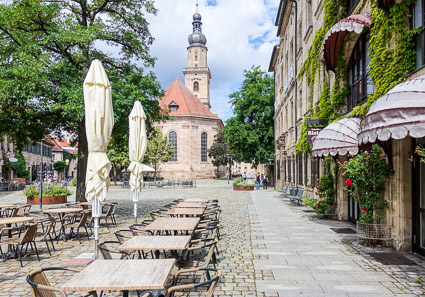 ABOVE: The cobblestoned streets of Erlangen's Altstadt are lined with historic buildings, shops, cafés, and restaurants. 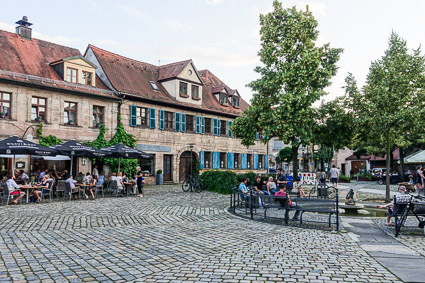 Erlangen is a university city of about 106,000 people near Nuremberg, Germany. The Main-Danube Canal passes Erlangen, and some Danube cruises that supposedly begin or end in Nuremberg use Erlangen as a port. We spent several days in Erlangen before our Emerald Star cruise from Nuremberg to Trier--not because our ship departed from Erlangen (it left from Nuremberg's cruise port), but because Cheryl lived in Erlangen for several years during her childhood and we hadn't visited the city in quite a few years. 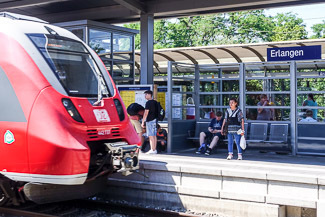 The station, which opened in 1844, has four platforms and is served by long-distance trains as well as S-Bahn and regional commuter trains from Nuremberg. 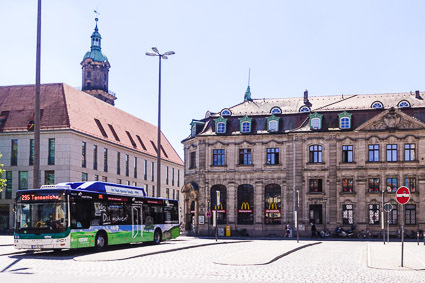 Travel time between Nuremberg's main railway station and Erlangen is 16 to 27 minutes, with "R" regional trains being faster than S-Bahn trains. From the train station, we walked about 10 minutes to the Hotel Rokokohaus, where we'd reserved a room through our hotel partner, Booking.com. 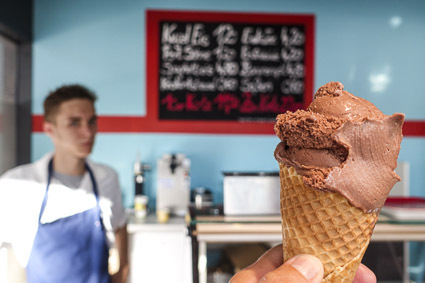 The Rokokohaus is located on the Theaterplatz in Erlangen's Altstadt (Old Town), just north of the city's Botanical Gardens. After unpacking, we took a short walk to the center of town. 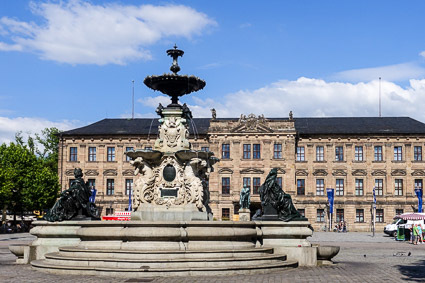 One of the first sights we passed was the Schloss, or Castle, which was commissioned in 1700 for the Markgrafen ("margraves") of Brandenberg-Bayreuth who ruled the city from 1603 to 1810. 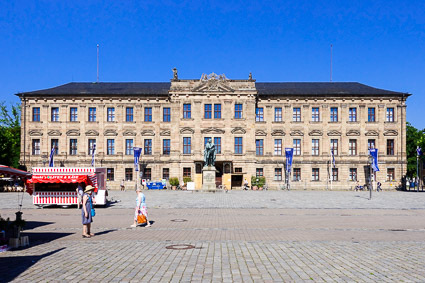 The castle is now the seat of Friedrich-Alexander-Universität, a.k.a. the University of Erlangen-Nürnberg. A block south was the Hugenottenplatz, where we'd been surprised to find a McDonald's occupying an historic building during our previous visit in 1978. The McDonald's was still there after nearly four decades. 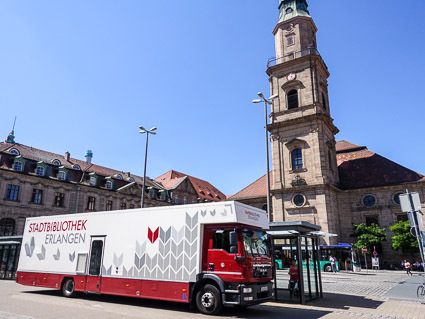 Also present was a bookmobile of the Stadtbibliotek or public library of Erlangen. 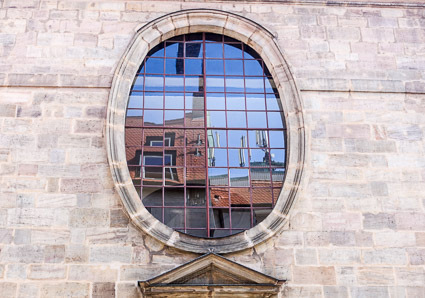 The dominant building on the square was the Hugenottenkirche, which opened in 1693 as the signature building of the newly-planned Baroque city center. 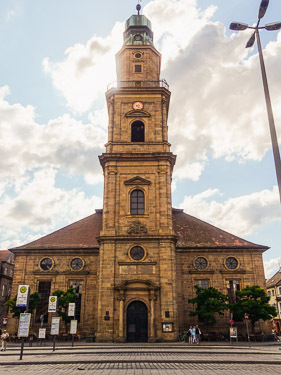 TThe church was financed by the local ruler at the time, Markgraf Christian Ernst von Brandenburg-Bayreuth, who had encouraged Huguenots (Protestant refugees from France) to settle in Erlangen. The church offered services in French until 1822. 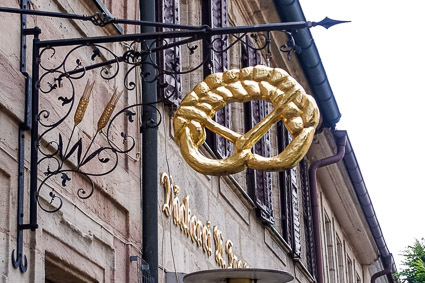 Downtown Erlangen appeared to have at least one bakery per block (sometimes two). 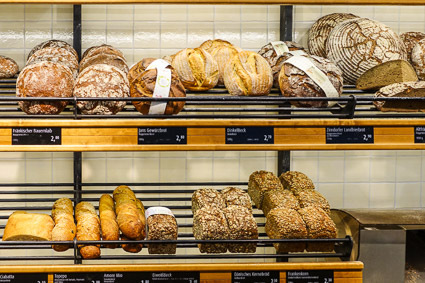 On our next visit, we'll stay long enough to rent a vacation apartment and subsist on whole-grain German rye bread, seeded rolls, peanut butter, and cold cuts for a week. 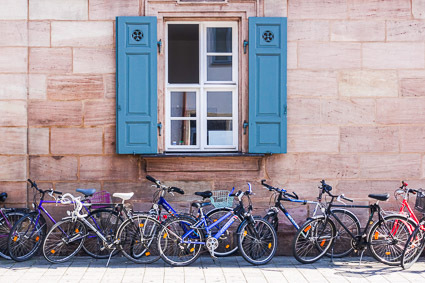 Erlangen is a university city with faculties scattered across town, so a bicycle is almost a necessity if you're a student. We saw bikes parked by the dozen, usually with cheap cable locks or even no locks at all. 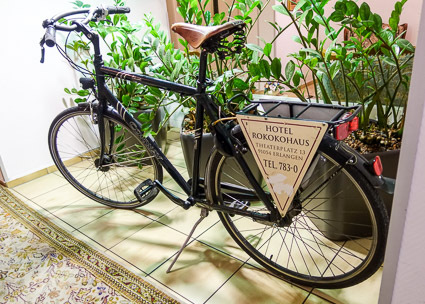 Even our hotel had bicycles that were parked in the lobby for guests to borrow free of charge. 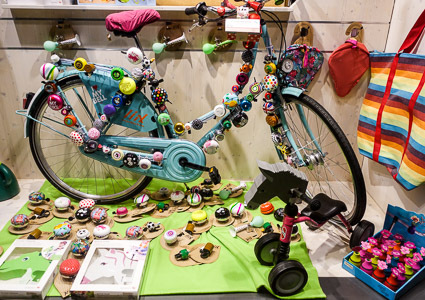 In the window of this shop, we saw the largest selection of of bicycle bells (mounted on a bike) that we'd ever witnessed. 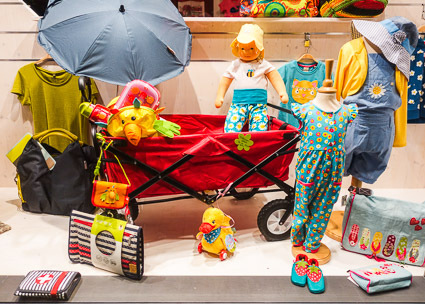 The shop also had a good assortment of toys (both traditional and modern), including something that we hadn't seen before: a folding red wagon made of steel tubing and cloth. 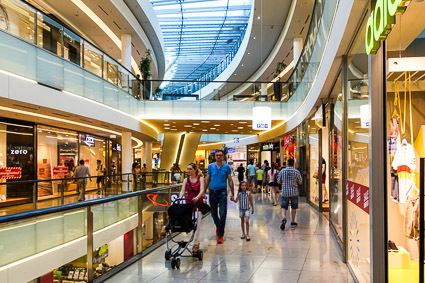 As we walked around the business district, we saw a sign for a shopping mall that positioned Erlangen as a world-class city. 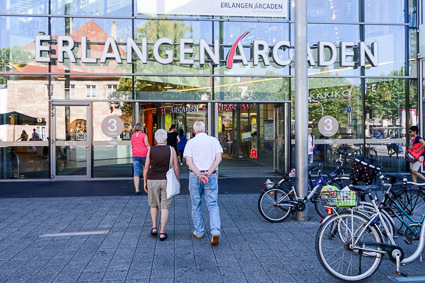 The mall, named the Erlangen Arcaden, was in the heart of downtown, where it surrounded by thriving shops and department stores. 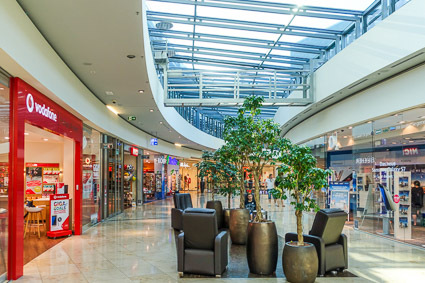 We aren't big fans of shopping malls, but we thought the Erlangen Arcaden was more appealing than most with its large skylight and curving layout. 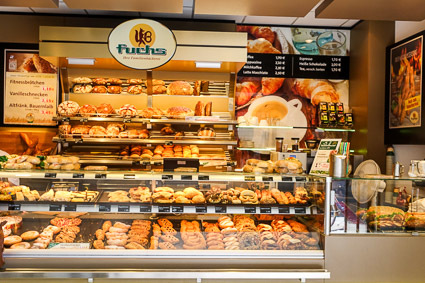 We also liked the fact that, in typical German fashion, the mall had shops where people could make everyday purchases--including bakeries, a pharmacy, and a branch of Germany's Post Office. 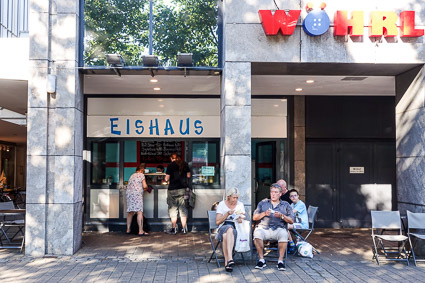 By now, we were feeling hunger pangs, so we refueled at the Eishaus, which had attracted a steady stream of customers on a hot summer day. We spent the rest of the afternoon just walking around and enjoying the city. 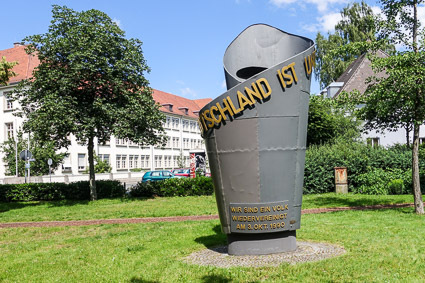 This photo shows the a monument to German reunification on October 3, 1990, with the inscription "Deutschland ist unteilbar" ("Germany is indivisible"). 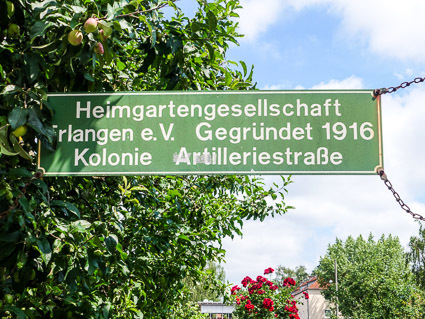 The city's community-garden organization, the Heimgartengesellschaft Erlangen, was founded during World War I. It consists of 80 garden allotments in five "colonies," including this 12-garden parcel on Artilleriestrasse. We read the list of rules, which require that at least a third of a member's allotment must be planted in fruit and/or vegetables, in keeping with the original purpose of the gardens. 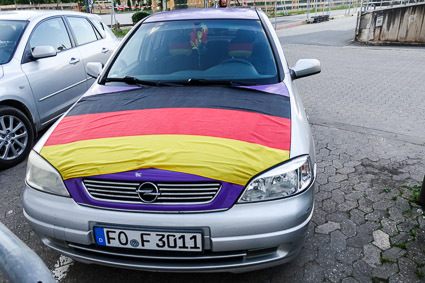 Germany was competing in the EUFA EURO championship tournament during our visit, and Deutschland's football fans proudly displayed their team's colors in Erlangen. 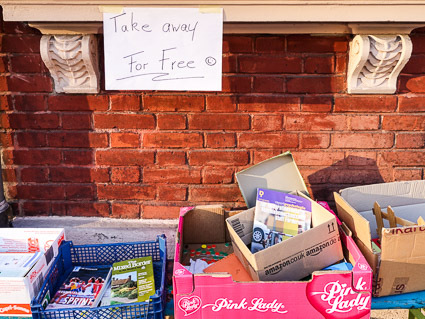 Erlangen has a large international population, thanks to its university and global companies like Siemens, so it didn't come as a complete surprise to see a "Take away for free" sign in English. 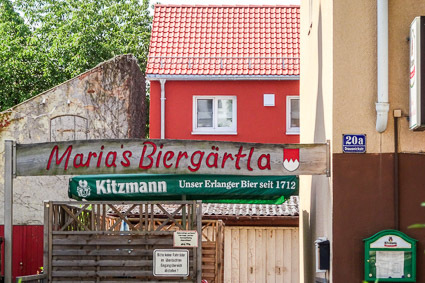 At the opposite end of the linguistic spectrum was a sign for Maria's Beer Garden in Franconian dialect. 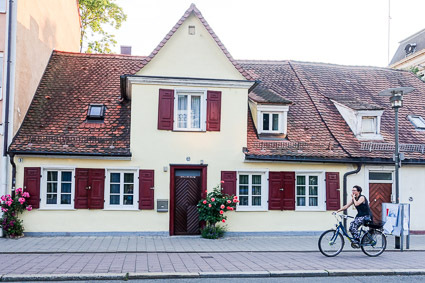 Erlangen has many modern buildings (due to a combination of World War II bombing and postwar growth), but you'll still find traditional houses in and around the city center. 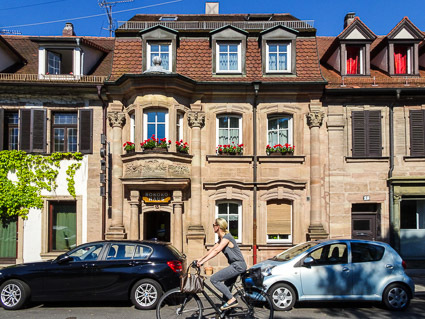 The city's apartment houses are mostly faced with stucco, and the building owners don't want their façades scuffed or nicked by bicycles. 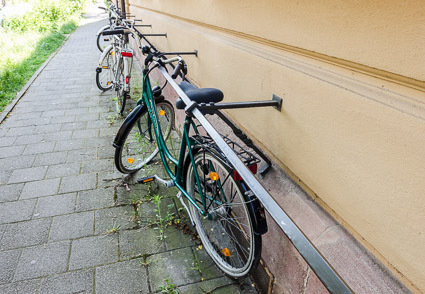 The solution: Railings that run along the buildings at waist height, providing a convenient place for bicycle owners to lean or lock their bikes. 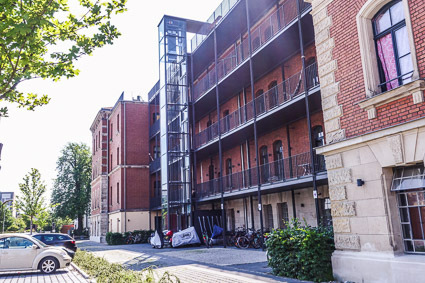 We were intrigued by the way some older apartment buildings (including these converted turn-of-the-20th-Century barracks) had been updated with elevator towers and bolted-on balconies. 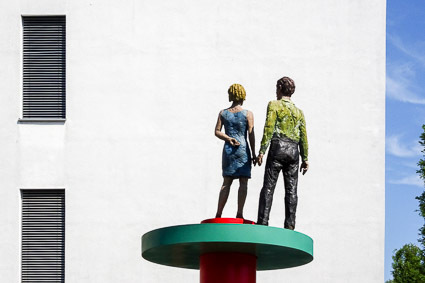 Erlangen's university has a medical school, and the town is well-equipped with hospitals and clinics of every description--among them, a Frauenklinik or women's clinic with a colorful sculpture of a man and a woman near the maternity entrance. The statue was created by Prof. Stephan Balkenhol in 2009. It's mounted on a pedestal that rotates with the wind, allowing the statue to change direction from day to day. Having tried to fend off lag by walking, we returned to the Altstadt (where our hotel was located) as our energy began to flag. 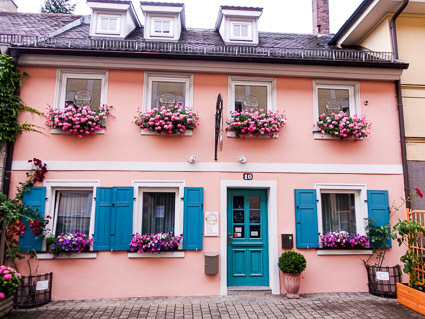 TThis pink house was typical of buildings in the Old Town. So was the cobblestoned pavement in front. 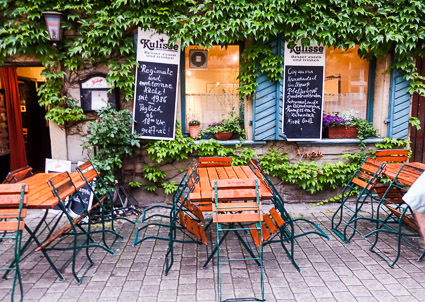 The Altstadt was a pleasant areas of cafés, restaurants, small shops, and historic buildings. 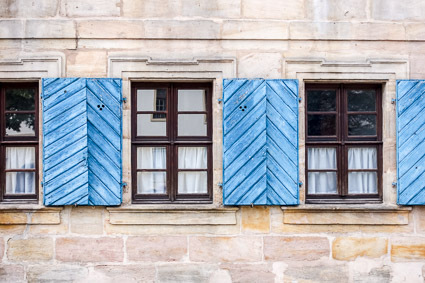 Many buildings in the Altstadt, such as this house made of stone, had traditional Franconian shutters with diagonal patterns. 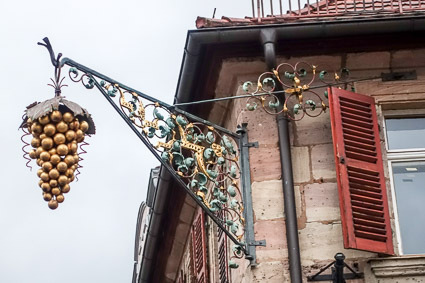 Gilded wrought-iron signs identified a wine merchant and a bakery. 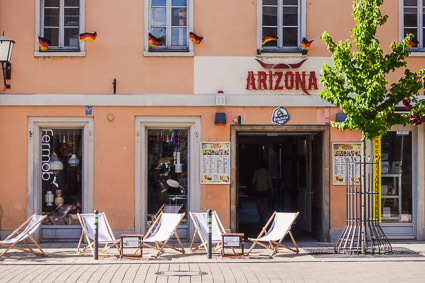 For Germans with Karl May Wild West tastes, the Altstadt had a bar & grill named Arizona that featured hamburgers, steaks, Tex-Mex specialties, and other symbols of the "American way of life " (including "Supersize Day" on Monday). AAfter eating dinner at a restaurant that served hearty German food--not easy to find in the Altstadt--we returned to the Hotel Rokokohaus. 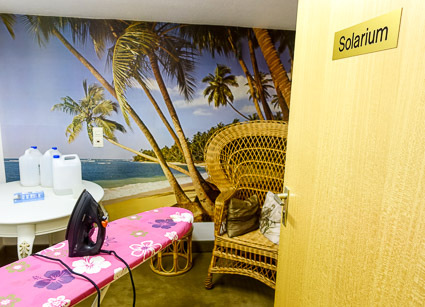 There, while exploring the premises, we discovered that the hotel's Solarium did double duty as an ironing room for guests who wanted to fantasize a beach vacation while pressing the wrinkles out of their shirts, skirts, and underwear.